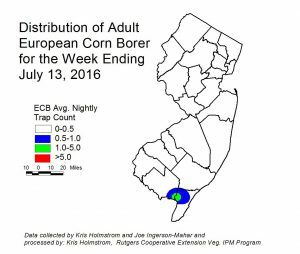 European corn borer (ECB) moth catches are very low, but showing signs of increase on the Cape May/Cumberland Co. border (se ECB map) . Most larval infestations, have passed. Be sure to begin monitoring plantings for ECB feeding while they are still in the whorl stage. 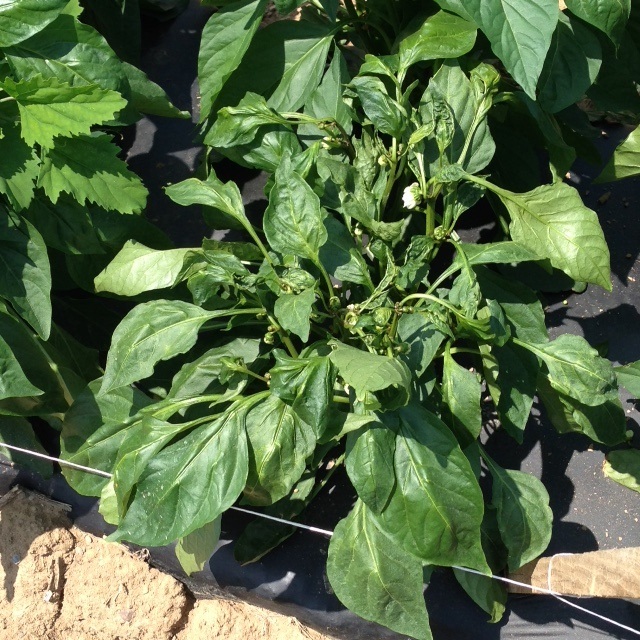 Consider treating when the number of infested plants in a 50 plant sample exceeds 12%. Feeding in the whorl stage will appear as numerous small holes (called “shot-hole”) on leaves, with damage present on consecutively younger leaves. As plants progress to pre-tassel and beyond, droppings and larvae may be found in or on the emerging tassels. Any planting remaining at or above threshold as it proceeds to full tassel should be treated, as this is the last stage at which ECB larvae will be exposed and vulnerable to insecticidal sprays. Insecticides that are acceptable in organic production include the spinosyn based material Entrust (IRAC-5) and Dipel (IRAC-11a). The 10G formulation of Dipel is particularly useful when granules can be dropped or broadcast such that they get into the whorls of corn plants. Other effective insecticides include Coragen (IRAC 28), and the synthetic pyrethroids (IRAC 3). See the 2016 Commercial Vegetable Recommendations Guide for a more complete list of insecticides. Infestations of fall armyworm (FAW) are gradually increasing. Thus far, most infestations are below threshold, but 12% infestations have been seen as far north as Warren County. 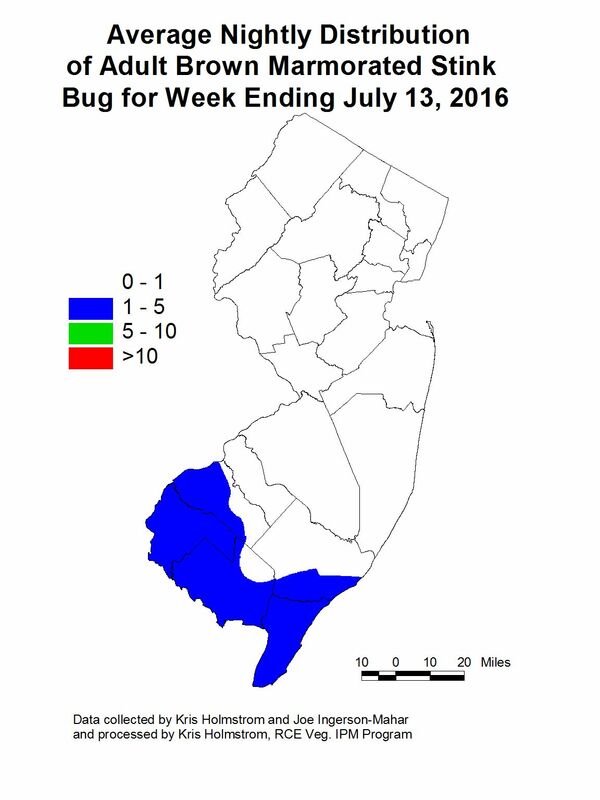 At present, the highest activity is in Cape May County, where infestations of close to 40% were found. FAW targets whorl corn of all sizes, and even very young plants should be checked weekly. FAW feeding is much more obvious than that of ECB larvae, with large ragged holes and conspicuous droppings found in the whorl. The larva is larger, and is general brown in color after it has molted twice (see photo at left). It is useful to note that FAW is less susceptible to the B.t. toxin found in older B.t. sweet corn lines. Therefore some FAW injury can still occur from seedling stage through ear development. FAW is also resistant to synthetic pyrethroid insecticides (IRAC 3), but can be effectively managed with insecticides such as Radiant/Entrust/Blackhawk (IRAC 5) or Coragen/Besiege (IRAC 28). Consider treating if damage from ECB and/or FAW reaches 12%. Corn earworm moth (CEW) captures in blacklights remain low. Slightly higher activity is occurring across the southern third of NJ (see CEW blacklight map), but individuals have been captured as far north as Monmouth County. In addition, a limited number of CEW pheromone traps have been deployed throughout the southern counties. These traps have captured low numbers of CEW moths over the past week. Highest activity from this n etwork has been found from Gloucester through southern Burlington County (see CEW pheromone map). The broad color patterns of this map are a result of the few numbers of contributing trap sites. Green areas on the map roughly correspond to a 4-5 day silk spray schedule, while blue areas would be 5-6 days. As sweet corn plantings begin to silk, it is critical that growers monitor local CEW moth numbers. For the present time, any sweet corn plantings in the silk stage should be treated to limit CEW injury as well as to prevent ear damage from ECB larvae that already inhabit the stalks. 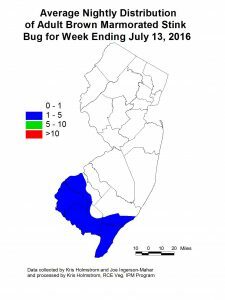 BMSB captures in southern NJ blacklight traps increased sharply over the past week. This rise in captures was not seen north of Gloucester County. The highest activity is currently in Cape May County (see BMSB map). At the present time, BMSB numbers are well below those seen in 2010-12. However, this increase will be monitored and incidents of injury from this pest will be documented. BMSB can be a pest on peppers, as well as sweet corn and beans. These crops are now entering bloom stage. Cucumber beetles are less of a threat at this stage, as the plants have attained enough size to avoid developing bacterial wilt from new beetle feeding. As scouted pumpkin and winter squash fields begin to develop fruit, we would expect to see powdery mildew (PM) develop. As yet, the most mature fields in the IPM Program are just reaching the vine-run stage and are free of powdery mildew. The action threshold for commencement of the protectant fungicide program for PM is 2 lesions per 100 older leaves. The most mature fields in the IPM Program are still approximately 2-3 weeks from fruit enlargement; the stage at which first PM lesions often occur. Several fields in the scouting program have begun to show signs of cyclamen mite or broad mite infestations. The presence of these microscopic mites is often indicated by the dramatic foliar distortion they cause on foliage (see photos at right). 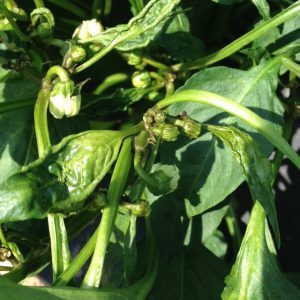 Infestations are often confined to clusters of plants, as the mites do not spread quickly. If left untreated, mite feeding will result in heavily russetted fruit. Miticides labeled for spider mite control in peppers are equally effective on cyclamen and broad mites. See the 2016 Commercial Vegetable Recommendations Guide for a more complete list of insecticides. One weevil caught in the Hammonton/Elm this past week. As far as is known there are no infested fields.